Two solid victories for Canada at the world junior hockey championship have helped restore confidence to a team that made an early exit at the 2016 tournament last January. Canada's next goal is to defeat Latvia on Thursday night (8:00 p.m. ET) at Air Canada Centre. Two solid victories for Canada at the world junior hockey championship have helped restore confidence to a team that made an early exit at the 2016 tournament last January. A New Year's Eve game with the archrival Americans is circled on the calendar, but Canada's next goal is to defeat Latvia on Thursday night (8:00 p.m. ET) at Air Canada Centre. The host team will not be taking the underdog Latvians lightly. Denmark's stunning 3-2 upset win over defending champion Finland on Tuesday at Bell Centre got everyone's attention. "It's part of the tournament and we have to respect every team. We saw what happened yesterday in Montreal," Canadian head coach Dominique Ducharme said Wednesday. "We're focusing on ourselves. We're a confident team and we just want to challenge ourselves to be better every time that we step on the ice." "There's little things that we can do better and that's the way that we look at it every day." Canada opened the preliminary round on Boxing Day with a solid 5-3 win over Russia. A comfortable 5-0 victory over Slovakia followed a day later. Canada has used a balanced scoring attack with nine different players finding the back of the net. 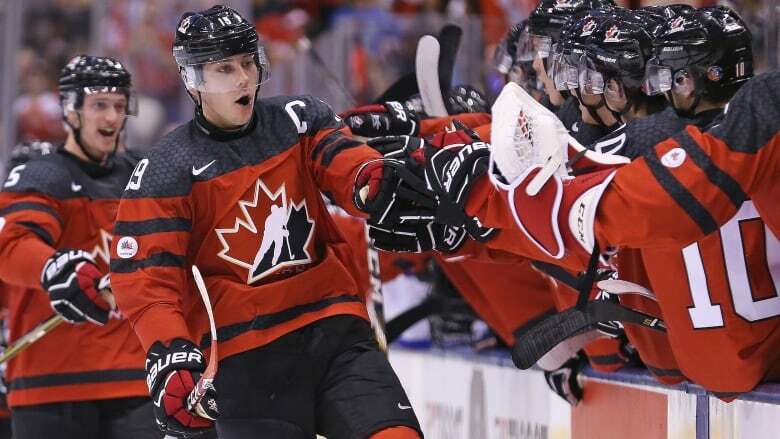 Captain Dylan Strome is the lone Canadian with two goals in the tournament. "It's great to see everyone involved and getting rewarded," Ducharme said. "I think our guys are working hard. To see scoring spread around like that is a good sign of the way that we're playing as a team." "We're going to be having success as a team and that's the way that we're doing it. Right now it's paying off and guys are getting rewarded individually, scoring is across all four lines and it's great to see." Canada backchecked well against Slovakia and held the opposition to just six shots on net. Connor Ingram earned the shutout after Carter Hart's 17-save performance in the tournament opener. Ducharme said the regular starter job could go to either goalie, adding he has yet to make a decision on who will be in net on Thursday night. "We have two goalies, two solid goalies," he said. "We like them both and we're confident with those guys in net. We'll see how things go." Latvia, which was promoted to the 10-team event this year, has only three players who are NHL draft picks. The start of the tournament has not been kind as Latvia has been outscored 15-2 over two losses. "Denmark beat Finland [so] anyone can beat anyone on any given day," Strome said. "You've got to be ready to play every game. We're gaining momentum for sure." Canada's Mitchell Stephens is questionable for Thursday night, Ducharme said. The forward is nursing a lower-body injury and is day-to-day. Canada is coming off a sixth-place showing at the 2016 tournament in Helsinki, its worst result since an eighth-place finish in 1998. This year's team has been tenacious on the forecheck and is using its overall speed to its advantage. "We're playing to our strengths and I think we're doing a really good job," Strome said. "From the goaltending to the defence to the forwards, I think everyone is doing their part. It's nice to see where we're at." Ducharme gave his players a day off Wednesday. He seemed impressed with the team's effort so far and has liked the work ethic. "They're really unselfish," he said. "They're playing as a team and we're growing as a team. That's what we want to do." Canada's last gold medal came in 2015, its first title in six years. Canada has won gold 16 times since the tournament's inception in 1977. The top four teams in each group advance to the quarter-finals, which will be split between Toronto and Montreal. The semifinals and medal games will be played at Bell Centre.